There is now a scientific, yet simple, technique that allows you to access your mind’s most powerful brain waves, which are normally hidden from your conscious thought… in that state between waking and dreams. Now it’s possible to draw out — anytime — those creative, transformative, and wise ideas normally tucked away in the hidden recesses of your mind! We have all had them, these “light bulb” moments that provide us with tidy solutions, which seem to come only after long periods of struggle or, perhaps worse, after we’ve almost given up trying to solve a problem. Think of how much simpler life would be if you could just tell your mind to “flip the switch” and give you the right answers at any time? Amazingly enough, this scenario is far from a fantasy. A simple six-step process, backed by years of scientific research, can help you to draw out your mind’s most powerful knowledge whenever needed. The breakthroughs, innovations, great ideas, insights, solutions, and even miracles you’re looking for have already been formulated inside your MIND. They’re sitting there right NOW. There’s a long blueprint for getting them out, and a short one. A hard way, and an easy way. I’m here to tell you about the short, easy way. A way that bypasses long, drawn-out, and often unsuccessful approaches to transformation and goes straight to the neurological source of your actions and outcomes. A way that’s supported by years of scientific research and backed up by the real-life experiences of thousands of people (and counting). A way — a shockingly simple six-step process — that enables you to actually COMMAND your mind to instantly reveal to you the specific knowledge, information, and answers you’re looking for. This process takes you one critical and possibly unprecedented step further. It empowers you to IMPRINT that knowledge onto every molecule of your being. Yes! I want to crack the code of the theta brainwave state and gain fast, effortless achievement of whatever goal I choose. I want to take advantage of this limited-time special discount and save $176 today! Science has long recognized the amazing features and functions of theta- the name given to the pattern your brainwaves take while you're sleeping. What makes the theta brain so interesting is that, as far as it's concerned, there's no such thing as "can't. " The limitations and restraints - good and bad - that govern your waking thoughts and actions recede when you're in theta. Your mind is free to imagine whatever it wants to. Free to make infinite connections and conceive of any possibility. When you're unconscious, this limitless, anything-is-possible thinking power produces dreams: strange, confusing, sometimes crazy, filled with scenarios that would never happen in real life. But when you shift into theta consciously and intentionally, you activate a truly extraordinary degree of power. Suddenly, you have control of an all-access pass to that vast, brilliant, untapped field of intelligence - the "unused 90%" you hear so much about. In an ordinary waking (or beta) mind brainstorming session, you might squeeze out one or two breakthrough thoughts over the course of a couple of tough hours. In theta, the breakthroughs just flow. Automatically. Easily. Uninterrupted. Command your theta mind to deliver a specific result, and, uninhibited by all the usual barriers to truly BIG thinking - I can't... I shouldn't... I don't know how... It would never work... It's just not possible - it will effortlessly "give up" its secret knowledge and give you everything it has. Which is so much more than your beta brain can even imagine. I first started hearing about Asara from our customers. Letters and phone calls started coming, a few at first, then more than I could keep track of. The gist of all of them was the same: This woman is an incredible teacher; she is teaching something that has never been taught before; her six-step process works, and it changes people's lives FAST; the rest of your customers need to know about it. In her seminar, Asara teaches a revolutionary process that enables those who use it to do everything I've just described - shift into theta, command you mind, imprint your body, reprogram your cells - with ASTONISHING speed, ease, and control. This streamlined and extremely powerful process - it involves just six simple steps - causes complete, multilevel, and HIGHLY TARGETED transformations to take place almost instantaneously. This process, and the seminar in which Asara teaches it, is called The OneCommand®. And it's quickly becoming one of the most talked-about and in-demand live events in the country. People travel thousands of miles to learn The One Command® - and walk away profoundly changed and empowered with the ability to quickly create remarkable turnarounds in their finances, health, happiness, and more. It didn't take long for me to feel certain that Asara Lovejoy was the real deal. And so I approached her - initially with the hope of recording one of her live events and reproducing it as an audio program so that we could bring the incredible experience of The One Command® seminar directly to our customers. So she came into our studios and recorded an intimate one-on-one version of her life-changing seminar. The same information. The same process. Everything you would get if you spent the time and money to attend one of her famous live events, and much more. But all of it presented DIRECTLY to YOU, to experience in your own space and at your own pace. Imprint Your DNA for Lasting Wealth and Happiness! I am THRILLED that we've published this groundbreaking program, and I'd love for you to experience it for yourself. Order right now and we will immediately ship you the full program. You'll get six remarkable audio sessions on six CDs, plus a Writable PDF Workbook designed by Asara to give you additional continuous guidance and support through the entire program. The original, complete OneCommand® process. Asara personally guides and instructs you through each of the six steps: ground, align, go to theta, command, expand, and receive, and she helps you to achieve total understanding and mastery of this potent, life-changing process. How to issue The OneCommand® correctly in order to achieve the results you want. Breathing, body posture, sentence structure, and delivery are all critical to issuing an effective command. Asara walks you through the mechanics and mind state of each individual step to ensure that you're achieving maximum benefit. The science and research behind The OneCommand®: How it works, why it works. The better you understand this, the more responsive your mind will be to opening and releasing its knowledge, and the more receptive your cells will be to receiving it. Gain FAST, effortless achievement in every goal you seek! Based on the huge amount of buzz surrounding Asara Lovejoy and her material, we're expecting a record-breaking demand for The One Command®. The good news is, you're among the first people to receive this email. But to make sure you don't have to wait, I suggest you order your copy right now by clicking on the link below. I look forward to receiving your order, sending you this program, and hearing about what you command and receive using this incredible process. YES, I want to crack the code of the theta brainwave state... command my mind to release the knowledge, information, and answers I've been seeking... and imprint those answers onto every cell of my being for fast, effortless achievement of whatever goal I choose. 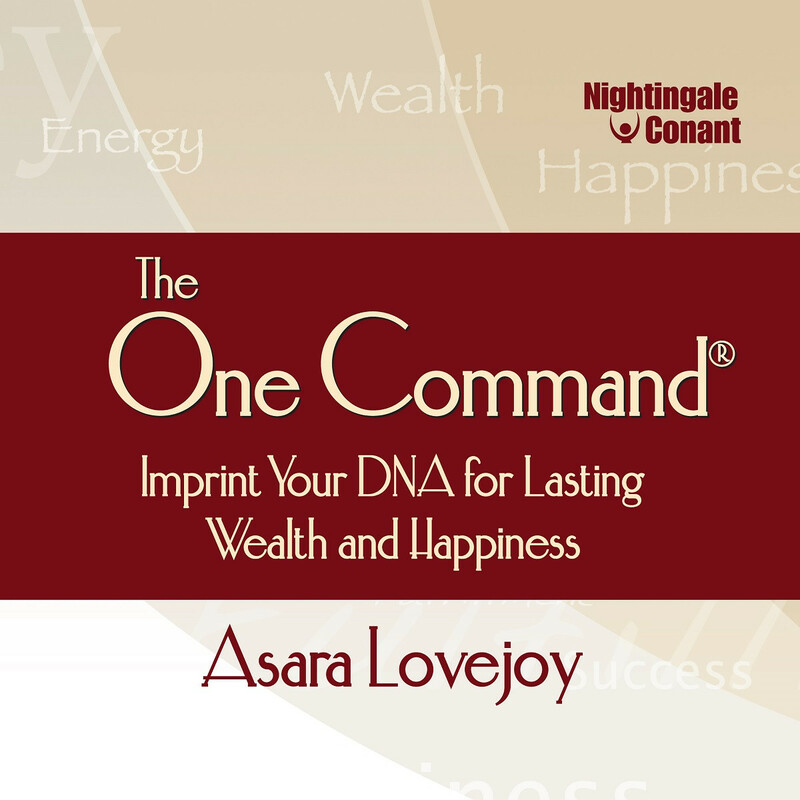 Please send me Asara Lovejoy's 6-CD audio program The One Command®: Imprint Your DNA for Lasting Wealth and Happiness - including 6 CDs plus Workbook on CD - for ONLY $58.95! That’s an incredible 75% OFF the retail price! Take advantage of this limited-time special discount now! If I don’t begin to experience lasting wealth and happiness, I can simply return the program in the next 30 days for a full refund. No questions asked.